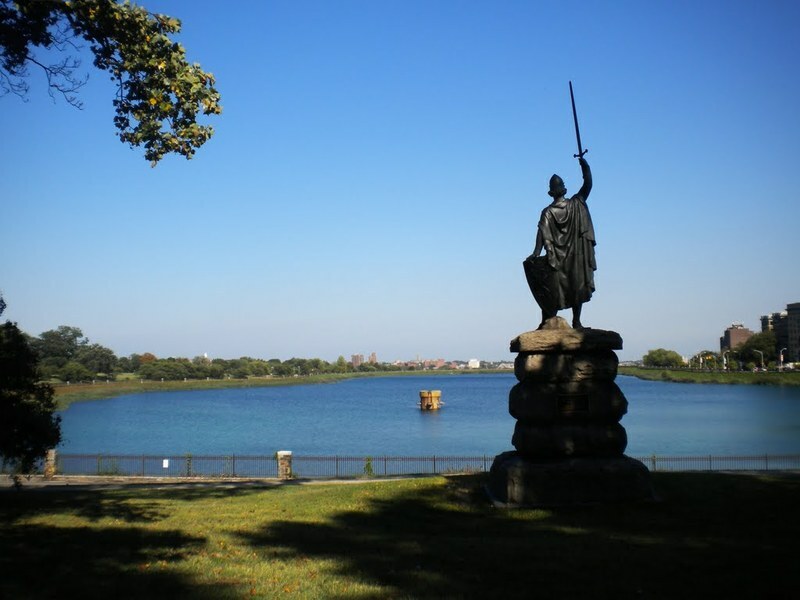 On the west side of Druid Lake, opposite of the Moorish Tower, stands an imposing statue. 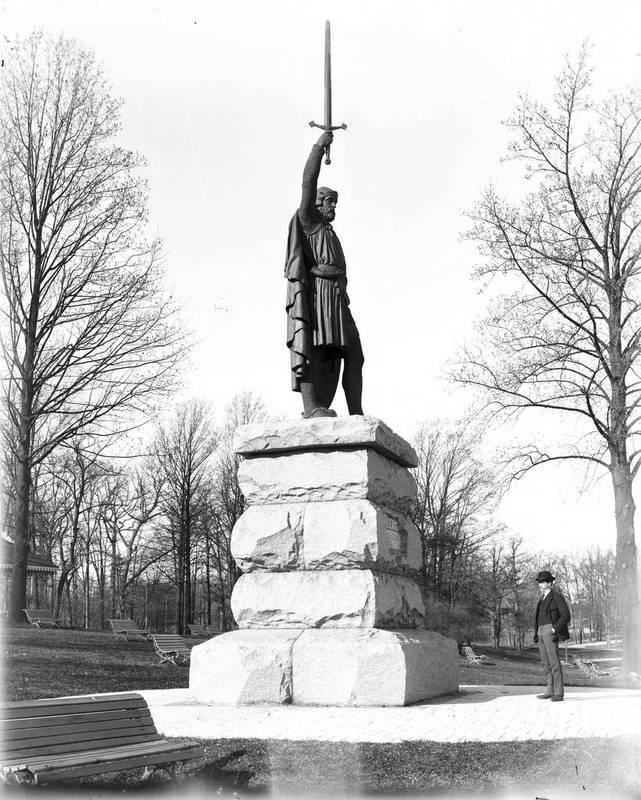 At nearly thirty feet from the ground to the tip of the sword, the Wallace the Scot statue strikes an imposing figure. 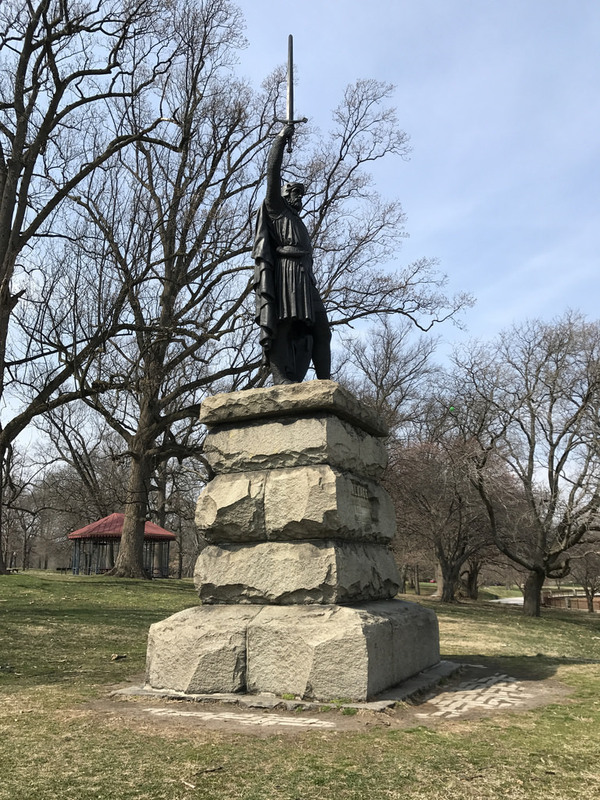 Bearing little resemblance to Mel Gibson’s “Braveheart,” the question remains of why a statue of a national Scottish hero is in Druid Hill Park. Beginning in 1905, the St. Andrew’s Society of Baltimore, or the Scottish Society, has used the Wallace the Scot statue as a site of pilgrimage. Gathering at the monument on St. Andrew’s Day, the anniversary of real William Wallace’s death, and the founding of their organization in 1806, members of the society wear traditional clothing (such as kilts or capes) and celebrate their heritage as Scottish Americans. By the 1850s, more than 100,000 Scottish immigrants were living in the United States and, between 1890 and 1910, this number grew to over a million. 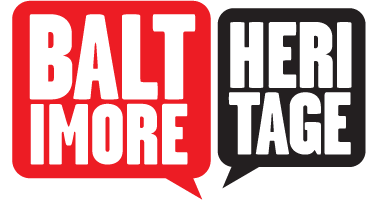 Successful Baltimore banker William Wallace Spence was proud of his heritage as a Scottish immigrant and claimed to be a distant descendant of William Wallace. Considering Wallace a personal hero as well as a national one, he shared how he admired Wallace’s character and saw him as a “champion of freedom whose memory not only Scotland, but all the world should honor." As the leader of the Scottish resistance against English rule, the original William Wallace spent most of his life battling with English forces for Scottish independence. His takeover of Stirling Castle is considered by many historians to be the first major victory for the Scottish resistance. Unfortunately, his victory was short lived and after a defeat at the Battle of Falkirk, Wallace was taken captive and executed in 1305. The statue itself is cast in bronze, a perfect replica of the famous William Wallace statue that stands on Abbey Craig in Scotland. Originally sculpted by D.W. Stevenson in 1881, Spence commissioned his replica at a large scale to make the figure seem more dramatic and imposing. The figure stands at an impressive fourteen feet tall, from his feet to the tip of his raised sword. The sculptor specifically chose the pose for its symbolic meaning—Wallace supposedly struck this pose at the Abbey Craig as he watched the army of Edward I gather before the Battle of Stirling Bridge. Stevenson also designed the pedestal upon which the Druid Hill Park statue now rests. 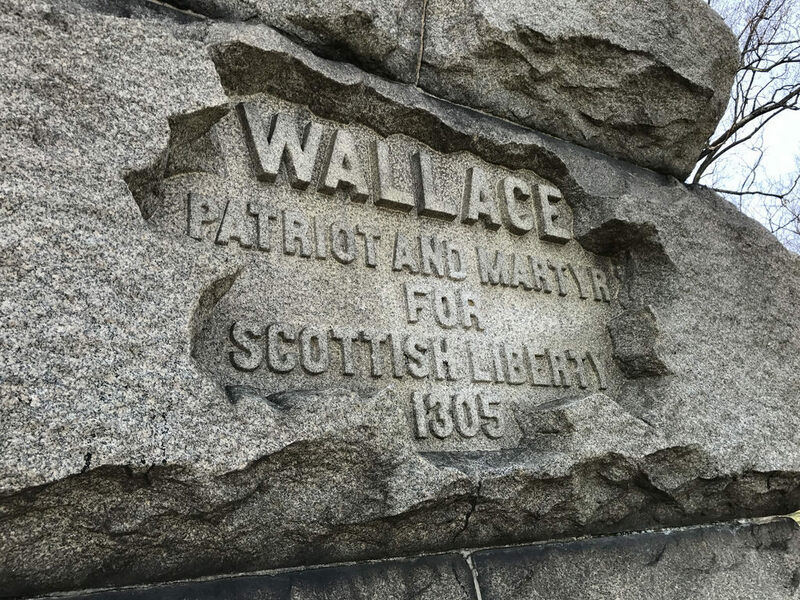 The sixteen-foot tall granite base was carved of Maryland granite and is engraved with the inscription "William Wallace, Patriot and Martyr for Scottish Liberty, 1305." 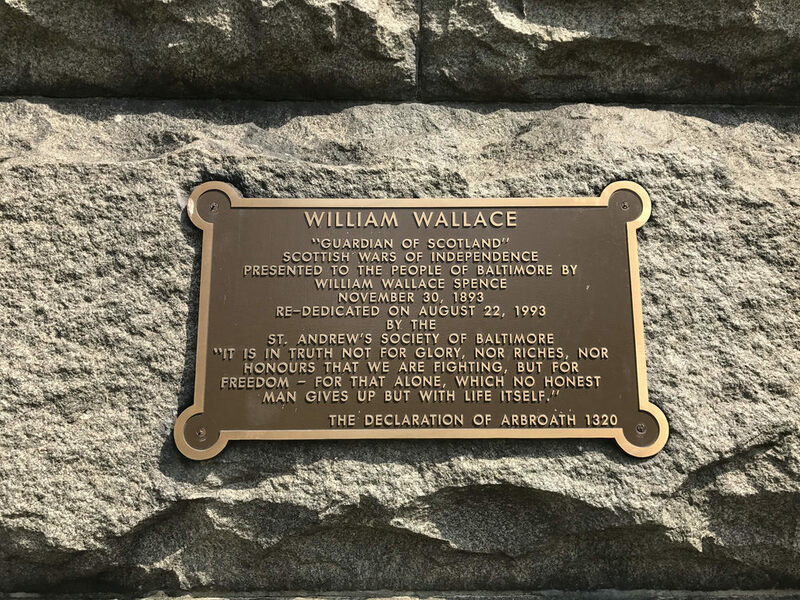 Jessi Deane, “William Wallace Monument,” Explore Baltimore Heritage, accessed April 19, 2019, https://explore.baltimoreheritage.org/items/show/346. Published on Jun 26, 2014. Last updated on Nov 27, 2018.